This article is about the game Super Smash Bros. for the Nintendo 64. For the series as a whole, see Super Smash Bros. (series). For the Nintendo 3DS and Wii U games of the same name, see Super Smash Bros. for Nintendo 3DS and Super Smash Bros. for Wii U.
Super Smash Bros. (known in Japan as Nintendo All-Star! Dairantō Smash Brothers ニンテンドーオールスター！ 大乱闘スマッシュブラザーズ) is a fighting game and the first installment in the Super Smash Bros. series. It was released for the Nintendo 64 and created by Nintendo and HAL Laboratory. Players must defeat their opponents multiple times in a fighting frenzy of items and power-ups, a unique health system, and on a variety of Nintendo-themed stages. 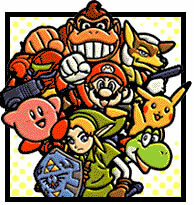 Although Super Smash Bros. is not a part of the Mario franchise, the game is heavily influenced by said franchise, more so than any other Nintendo franchise. The English game's title screen. Donkey Kong is turned into a star, while Mario is awarded a point for his KO and Donkey Kong has lost a point. Super Smash Brothers has a considerably different fighting style than other fighting games. Rather than each player having a life gauge that begins full and gradually decreases with each attack taken, Super Smash Brothers has a unique system. Players starts at 0% damage and with each hit they take, the percentage rises depending on how powerful the attack is. As players' percentage gets higher, players are blown further away with each attack. The objective of the game is to knock out opponents from the screen so they cannot return to the stage or knocking out opponents so hard, opponents turn into a star. Getting defeated by an opponent is called a "TKO". In time mode, this results in a loss of one point, while in stock mode, this counts as a loss of one life. Players regenerate on a descending floating platform at the center of the stage, unless they have no lives left. Players can exit by either moving, jumping, or waiting a few seconds. Players are invincible for a short amount of time after they exit the platform. Items are also an important component of the game. Depending on the settings set in the menu, the frequencies and types of items appearing can be altered. Some items are more powerful than others, while some are used to heal the user rather than attack an opponent. Below are specific rules and differences between the two fighting modes: Time and Stock. In Time mode, TKOs count as one negative point for players that are knocked out of the screen. Players that caused them to fall receives one positive point and is recorded as a "KO". If a player accidentally or intentionally falls off the stage without being influenced by other players, or if the player hits a wall before being KO'd, the player loses one point while nobody gains a point. At the end of the time period, a player that has the most points is declared the winner. If there is a tie, then the match will go to Sudden Death. The tied players have a quick stock battle with one life, starting with 300% damage, which will usually cause an instant KO when hit. Also, after a certain time, Bob-ombs start falling at random places on the stage, making survival more difficult. The winner of Sudden Death wins the match. A Stock Match with four players and three teams. In stock mode, there is still a point system, but wins are focused on number of lives left. Each player begins with a set amount of lives. Each time a player is defeated, he or she loses one life. Unlike Time mode, the number of KOs are irrelevant to the results because it is a game of survival unless it is a team match. This also means that matches could theoretically be endless. If there is a tie, a tiebreaker called a Sudden Death match occurs, where all players begin with 300% damage and one life. The last one standing wins. Players can fight alone or in teams. Allies usually cannot be hurt by other teammates unless team attack is turned on. Also, if players manage to defeat an ally, they get a point while the ally loses a point, unlike in the succeeding games where both teammates lose a point. If a team wins, players in the team with the most KOs gets the first place honor. This is the only game that shows who KO'd whom during a stock match. The default cast of characters. Super Smash Bros. features 12 playable characters from various Nintendo franchises, eight being default and four of them unlockable. Of the roster, there are four characters from the Mario franchise: Mario, Luigi, Donkey Kong and Yoshi. Peach's Castle A stage with one large platform, two mid-air sloped platforms at the side, and a moving platform towards the bottom. There are two bumpers in the upper right and left-hand corners of the stage. The challenger match against Luigi takes place here. Congo Jungle A stage sloped towards the middle, with platforms on either side. There is also a Barrel Cannon moving side to side at the bottom of the stage. If players are to fall into it, the barrel would start rotating and the players press the button, they can launch in whichever direction the arrow is pointing. This stage is the home stage of Donkey Kong. Hyrule Castle A very long stage, and the first stage of the single-player mode. It does not have many gimmicks, except for a whirlwind that appears every 30 seconds. The tornado sends players flying with a percent cost, and it can turn unlucky players into stars depending on the location and percent. The tornadoes appear in 4 places in this stage. This stage is the home stage of Link. Planet Zebes A small stage that is easy to get blasted off of. The only other feature is the acid, that rises up about every 30 seconds. The acid hurts players and knocks the player out of the stage if the percent is high enough. The acid also makes it nearly impossible to score a KO in the bottom part of the stage. This stage is the home stage of Samus. Also, the challenger match against Captain Falcon takes place here, as the game features no stages from the F-Zero series. Yoshi's Island A stage slightly sloped on either side, meant to look like a book. There are also three mid-air platforms, two of which are also slanted. Clouds on the sides of the course can be stood on, but they will disappear if the player stays on the platform for a period of time. This stage is the home stage of Yoshi. Dream Land A flat stage, with Whispy Woods at the center. Whispy sometimes blows air that pushes players in the direction he is facing. This stage is the home stage of Kirby. Also, the challenger match against Ness takes place here, as the game features no stages from the EarthBound series. Sector Z A very large stage, set on the Great Fox. Occasionally, an Arwing enters the screen and fires blasts of beams at the players. The stage is the largest of the game, considering the length of the blast lines. This stage is the home stage of Fox. Saffron City A large stage that features the most gimmicks. It is the home stage of Pikachu and Jigglypuff, and the challenger match against Jigglypuff takes place on this stage. Various Pokémon emerge from the building in the middle, having effects on gameplay. Mushroom Kingdom A large stage, featuring some gimmicks: moving platforms, Warp Pipes, and others. Clear 1-Player Game with all default characters, and play each stage in VS Mode. There are many items throughout the game that help fire up the battle. All items will disappear after a period of time it is unused or if it is used to a certain extent. The following is a full list of them. Super Smash Bros. series The Crate is a wooden box that contains a random item, which can be released by breaking it open or throwing it to the ground. Barrels are similar, but can roll along the ground if hit. Capsules and Eggs are lighter than Crates and Barrels. Sometimes these items will explode. Mario series When grabbed and thrown at an enemy, this item explodes, but if left alone, it will start walking around until its timer reaches zero. Mario series The Fire Flower can be used to blast opponents at close range with fire. Mario series The Green Shell can be thrown, and then slides along the ground, being able to hit multiple characters. The Green Shell will disappear after being used a certain amount of times. Donkey Kong series A character that obtains the hammer will start automatically attacking with it (much like the original Donkey Kong arcade game), causing significant damage to opponents hit. Mario series Similar to the Green Shell, but does less damage and homes in on characters. Mario series The Star makes the player invincible for several seconds. Players with this item do not take damage from their enemies and cannot be hit or grabbed. However, they can still fall off the stage and self-destruct. Super Smash Bros. series This is a sword that can be used to attack opponents with greater attack power. Super Smash Bros. series This item can be very powerful; although it can't be thrown far, the player can use it to attack opponents and inflict a large amount of damage, usually an instant KO. GoldenEye 007 When thrown, these will activate wherever they land. The first character to approach an active bomb will take damage and be sent flying. Super Smash Bros. series When thrown, this item remains in the same spot. If any character, including the user, touches it, they will take damage, and be pushed in a single direction. Super Smash Bros. series Because it is light, this item is good for quick attacks. But it doesn't do much damage and can't be thrown very far. Pokémon series When thrown, the Poké Ball opens up, and a Pokémon pops out. The Pokémon that appears is random; it performs its special skill and leaves. Kirby series When the Star Rod is used, stars come flying out of it, hitting other characters. If used with smash, a large star will fly out. The Star Rod has only a limited amount of large stars it can shoot. Kirby series This is a healing item that restores up to 100% of damage. The Legend of Zelda series The Heart Container fully reduces the player's damage to 0%. Super Smash Bros. series The Ray Gun can hit enemies from a distance with its long-range laser shot. 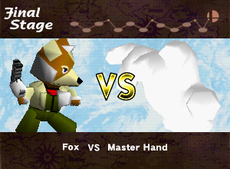 The Stage progression screen for the Final Stage with Fox as the player's character. In single-player mode, before a player starts the game, a character, difficulty level, and number of lives is selected. The difficulty levels range from Very Easy, Easy, Normal, Hard, to Very Hard. The number of lives can be set anywhere from one to five lives. The number of lives carries over from the previous match, which means any lost lives are not restored each level. Once the player loses all lives, they can choose to continue, but will have their current score cut in half. Alternatively, they can quit, which will result in a Game Over. All stages work with the stock system and opponents and allies have one life each. There is a time limit of five minutes per match, but players can choose to disable it. If in the case the player runs out of time in a level with the exception of Bonus Stages, they will go to the Continue screen (as if they had lost all of their lives), regardless of the number of lives the player had remaining. The player fights Link at Hyrule Castle. The player fights a team of 18 Yoshis in Yoshi's Island. The player fights three Yoshis at a time. When one is defeated, another one will take its place, until all are defeated. The player fights Fox in Sector Z. Break the Targets! The player has to hit the 10 targets within a time limit of 2 minutes. Each character has a different arena for his target test. Dying in the target test causes the failure of the test, but not the loss of a life. The player fights Mario and Luigi on Peach's Castle. The player also gets a randomly chosen ally. The player fights Pikachu in Saffron City. The player fights Giant Donkey Kong in Kongo Jungle. The player gets two randomly chosen allies. Board the Platforms! The player has to land on all 10 platforms within 2 minutes. It is similar to Break the Targets!! ; the player can get KO'd and fail the test, but it doesn't constitute towards the loss of a life. The player fights a team of 8 Kirbys in Dream Land. Seven of them already have abilities from the other 7 default characters. The last one is either the regular Kirby or one with an ability of one unlockable character. The player fights two at a time. The player fights Samus on Planet Zebes. The player fights Metal Mario at Meta Crystal. Race to the Finish! The player has to reach the white door at the end while avoiding three Fighting Polygons, bombs, and bumpers within one minute. Like the two previous bonus stages, failure does not result in the loss of a life. The player fights a team of 30 Fighting Polygons on the Battlefield stage. The polygons are fought three at a time. The player fights Master Hand. Unlike the player, the Master Hand does not have a percentage of damage, but 300 hit points. The battle takes place on Final Destination. 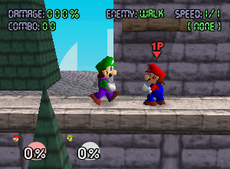 The player is controlling Mario while the CPU, Luigi, is set to "Walk." Training mode is, as the name suggests, a mode primarily used to practice and simulate battles for improving skills or for beginners to learn controls and moves. There is no time limit or a set number of lives, and whatever happens in Training mode is not recorded. There are multiple adjustable factors within this mode that are not available in regular VS. mode. Primarily, the computer player's actions can be set to either Stand, Walk, Evade, Jump, or Attack. In any case, if the computer player is about to get knocked off the stage, they will make an effort to recover. Another ability available from the pause menu is to be able to make any item spawn. Up to four items can be on the stage at once. The speed of the game is also adjustable. Besides normal speed, it can be set to 2/3, 1/2, or 1/4 speed. Lastly, the camera view can also be changed from normal to close-up; close-up view follows the player at a close angle. Unlike later Super Smash Bros. games, the computer player cannot be controlled using a controller, and only one computer player can be present at a time. Yoshi playing in the Board the Platforms mode of Bonus Practice. The final mode in single-player mode is Bonus Practice. There are two games, "Board the Platforms" and "Break the Targets". Both games appear as bonus stages in the One-player mode. Unlike other modes, if the player waits after selecting a character, the game automatically starts. Each character has a unique stage that has ten platforms of various sizes. The objective is to land on each of the ten platforms in the least amount of time possible. 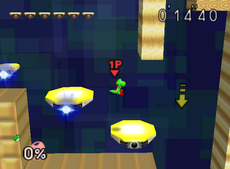 Some platforms move while others must be jumped on with the correct timing or the player gets damaged. If the player falls from the stage, it is a Failure, and the player will be sent back to the character selection screen. Similarly to Board the Platforms, Break the Targets has a unique stage for each player. The objective in this game is to break ten targets placed throughout the stage by hitting them with an attack. Like Board the Platforms, some targets move, while others are stationary. There are no extra lives, so once a player falls, the trial is a failure, and the player will be brought back to the character selection screen. In VS. mode, the player can pick up to four fighters to fight in a battle. A fighter selection screen is seen, and the players are able to pick which fighter they want. They can also select the costume color for each character. The player is also able to set rules for this match; in a time match, the player can pick the amount of time that can be played, and in a stock match, the players can pick the amount of the lives they and the computers have. Also, after playing a certain number of VS. matches, players can choose which items will appear during matches (not in an order, as they are picked randomly). There's also a handicap setting, which allows human players to adjust their attack power and knockback resistance. The damage setting allows players to adjust how quickly fighters can get KO'd at low damage; ranging from a minimum of 50%, to a maximum of 200%. The next screen is the stage selection screen, where players pick the stage to play on before the battle starts. Besides the default Free-for-all mode in which players fight each other, there are also team battles. Players can divide into up to three teams and fight against the other team(s). Also, lives are shared, so if one player is eliminated from a team, given that another team mate has 2 or more lives remaining, the eliminated player can recover by borrowing one ally's life by pressing the . Teams are distinguished by costume color of each player, which is either red, green, or blue. In Super Smash Bros., VS. mode is notably the only multi-player mode in the game. In the options mode, players can adjust a few game settings. They can adjust the sound to be mono or stereo. Super Smash Bros. is currently the only game in the series where players cannot adjust the music or sound effects volume. The next option is screen adjusting. Super Smash Bros. is also the only game in the series to have this option. The next option is the backup clear, which removes the game's data, which cannot be restored. In the European version, there is an additional option for changing the game's language to English, French or German. The VS. record of Fox. 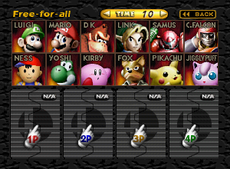 The last menu, the records, shows the profile of each character (and any unlocked characters), which is very similar to trophies in later games in the Super Smash Bros. series. The next part is the VS. Records, where players can see how many KOs, TKOs, and SD's are recorded. By pressing , the player can see how each character is ranked by KOs, SDs, Win Percentage, etc. By pressing the button again, players can view the character's record in detail, showing how much damage was given or taken and the ratio of KOs to TKOs to a certain character. It also shows the character's share of total playtime by percentage. The last of the records is the unlockable Sound Test. Players can hear sound effects, voices, and/or music from the game. Players can unlock the Sound Test by completing both Break the Targets and Board the Platforms with all characters. N64 Peer Schneider, IGN 8.5/10 "I've been playing Smash Bros. since its Japanese release -- and I still love the game. But I have to admit that I spent most of the time playing the multiplayer modes. It's not that the one-player mode is bad -- HAL tried to add a bit of variety by offering bonus stages and team fights, but the order of your opponents never changes and you'll find yourself playing just to get the hidden stuff. But plug in a few more controllers and the game comes to life. The character balance may seem a bit unfair at first (watch out for Kirby and Pikachu), but every fighter has his weaknesses and can be defeated. Well, Jigglypuff is a different story... What a strange character. I sincerely hope Nintendo creates a sequel to this game on its next game console and includes not only the characters from the main game franchises, but also secondary and lesser known ones (Ganondorf, Wario, Toad, Meowth, Pit from Kid Icarus, Banjo-Kazooie -- the list is endless). As it stands, Smash Bros. is an excellent choice for gamers looking for a worthy multiplayer smash 'em-up. Players looking for a Tekken-killer on N64 will have to wait a bit longer." N64 Jeff Gerstmann, GameSpot 7.5/10 "The game is extremely simple to learn and reasonably easy to master. The one-player game won't exactly last a long time, unless you count the time you have to spend unlocking all four of the hidden characters. So, if you've got a crew of friends ready to pick a Nintendo character and throw down, then Super Smash Bros. is definitely worth a purchase." Super Smash Bros. was developed by HAL Laboratory, a Nintendo second-party developer, during 1998. It began life as a prototype created by Masahiro Sakurai and Satoru Iwata in their spare time entitled 'Kakuto-Gēmu Ryūō' (格闘ゲーム竜王 ?, lit. "Dragon King: The Fighting Game"), and originally featured no Nintendo characters. However, Iwata hit on the idea of including fighters from different Nintendo franchises in order to provide "atmosphere" which he felt was necessary for a home console fighting game, and their idea was approved. The game had a small budget and little promotion, and was originally a Japan-only release, but its huge success saw the game released worldwide. SmashWiki article: List of bonuses#Super Smash Bros.
Super Smash Bros. features many special bonuses the player can receive after completing a certain type of task. Note that unlike Super Smash Bros. Melee, these bonuses cannot be gained in multiplayer matches, only in single-player mode. Bonuses are not required to achieve, but are purely for high-score setting purposes. Earning all bonuses in this game does not earn the player any reward of some sort, and no list is kept in the game when a bonus is achieved. Bowser, Mewtwo, and King Dedede were planned as playable characters, but they were cut. Peach's Castle initially lacked the sign, bridge and sliding stone block present in the final version. Early version of Peach's castle. All 4 players must be Link. At Hyrule Castle (or any place with a straight wall), all four Links should walk to the right, fall into the place with the canopy, and run left against the wall so they are inside each other. Then let the game push them all apart. After this, all 4 Links must simultaneously throw bombs upwards weakly, quickly. After just a few throws, the bombs will hit each other and continuously stay, trapping the players within. Only 2 players are required for this glitch. One should be Ness, and the other should be Fox. Choose a stage with a direct line between Ness and Fox (ideally, Hyrule Castle or Sector Z). PK Thunder against Fox's reflector so that the PK Thunder is in direct line back to Ness, and quickly bat the PK Thunder away. The thunder should have 2 tails, and if it reaches the edge of the screen, the game can't handle it and will freeze. The player must be Mario or Luigi and go to the Hyrule Castle (or any stage with a straight wall) and keep rolling into it. If the player does it correctly, Mario or Luigi should move toward the screen or away from the screen, giving the game a 3D effect. For this subject's image gallery, see Gallery:Super Smash Bros..
Donkey Kong: One of Mario's alternate costumes is based his original outfit. Also, one of Donkey Kong's alternate costumes is based on the color scheme of his sprite. 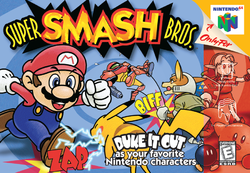 In addition, although not in the game itself, the Nintendo Power ad for the game indirectly alludes to Mario and Donkey Kong's origins as rivals by mentioning off-handedly that Mario and Donkey Kong have not "duked it out" for more than a decade. Wrecking Crew: One of Mario's alternate costumes is based on Foreman Spike's colors and one of Luigi's alternate costumes is based on the color scheme of his sprite. Also, another of Mario's alternate costumes is based on the outfit from the Spanish box cover. Super Mario Bros.: The Mushroom Kingdom stage refers to the original game with a flagpole and a castle. Also, one of Luigi's alternate costumes is based on the color scheme of his sprite and another is based on the flashing animation colors of his sprite. Super Mario World: Luigi's default costume is based on the color scheme of his sprite. Also, in addition to the Green Yoshi being Yoshi's default costume, three of Yoshi's alternate costumes are the Red, Yellow and Blue Yoshis. Mario Kart series: Although not in the game itself, the Nintendo Power ad when announcing Super Smash Bros alludes to both Super Mario Kart and Mario Kart 64 when stating that Nintendo's famous cast had previously "raced go-karts" when announcing their new role in the fighting ring. Mario Party: Although not in the game itself, the Nintendo Power ad when announcing Super Smash Bros alludes to Mario Party when stating that Nintendo's famous cast had previously "partied heartily" when announcing their new role in the fighting ring. Donkey Kong (Game Boy): Two of Donkey Kong's alternate costumes are based on the color scheme of his sprites on both the Game Boy and Game Boy Color screens. Donkey Kong Country: Donkey Kong's default costume is based on his appearance in this game. Also, the Kongo Jungle stage is based on this game. His 1P Mode ending also was taken directly from the stock art for Donkey Kong Country. Super Mario World 2: Yoshi's Island: Two of Yoshi's alternate costumes are based on the Cyan and Pink Yoshis. Super Mario 64: Mario's moves and voice clips were taken from Super Mario 64. Although Luigi was absent in Super Mario 64, his moves and voice clips are identical to Mario's, but sped up. Also, Mario's default costume is based on his outfit in this game and the Peach's Castle stage is based on this game. Yoshi's Story: Yoshi's voice clips were reused in this game. Also, the Yoshi's Island stage is based on this game. Yoshi's 1P Mode ending, where Yoshi is trapped between a book, also was a direct reference to the plot of Yoshi's Story where Baby Bowser cursed Yoshi's Island to become a storybook. Super Smash Bros. is the only game in the Super Smash Bros. series to receive an ESRB rating of E for Everyone. Its successors are both rated T for Teen while the Nintendo 3DS and Wii U versions (alongside Super Smash Bros. Ultimate) are rated E10+ for Everyone 10+. When the player chooses a character, the character will do a short animation in the player's box; so far, this is the only game in the series that does this. This is the only game in the Super Smash Bros. series where the characters are not trophies. They are dolls and the stages are dioramas brought to life by Master Hand. This is the only Wii Virtual Console release related to the Mario series that has not been re-released on the Wii U's Virtual Console service. This page was last edited on April 7, 2019, at 20:13.